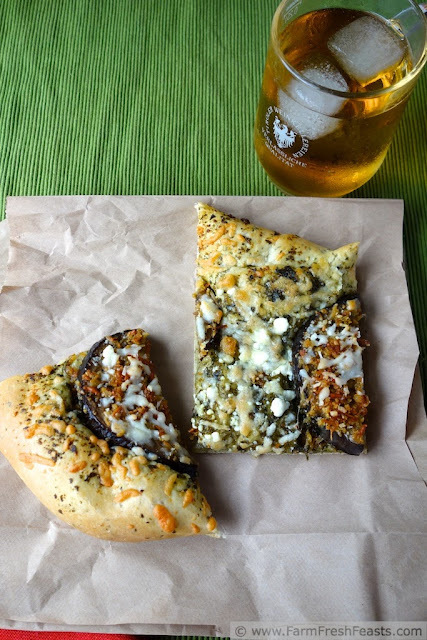 Cheesy, crunchy, breaded eggplant slices on a pesto pizza crust spread with extra pesto and topped with shredded Italian and crumbled feta cheeses. If you've been or known a picky eater, could you ever imagine that picky eater to say "this spaghetti sauce needs more cowbell some eggplant"? My kids were picky, or at least not game for any vegetable, when we first started getting a CSA farm share. Ever since I figured out that I could take the farm share eggplant and puree it with other vegetables to make spaghetti sauce (my first ever posted-on-the-internet recipe, at Tasty Kitchen, is here) I haven't had eggplant the way I love to eat it--breaded and covered with cheese. Since the kids will eat eggplant in spaghetti sauce, that's what we do with our farm share eggplant. Period. Until this blog happened along, which probably coincided with me thinking that, just this once, I'd like to eat eggplant as the star of its own show, not as a bit player in an ensemble. I've been all about treating myself this summer, making foods that I want to eat, and this is another one of those. It's my hope that you'll also benefit from my self-pampering. This is the third time recently that I've posted a recipe-within-a-recipe, and I hope I'm not violating some sort of blogger laws or setting up some unrealistic expectations. 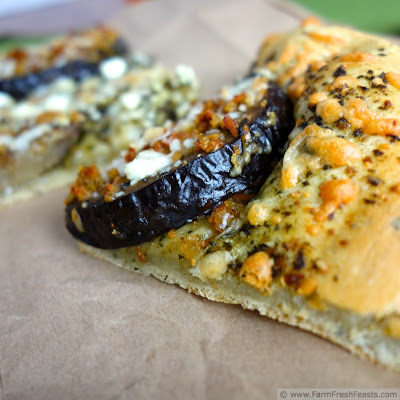 Just like you don't need to make pizza with your Sun Dried Tomato Pesto, nor do you need to use Kale Hummus in your Fattoush Dip, you don't need to make Baked Eggplant Chips the way I describe below in order to make Baked Eggplant Chip Pizza. You can make them another way. The first eggplant chip recipe I ever had was from my CSA in Virginia, Blenheim Organic Gardens, and you can find Becky's tasty eggplant chip recipe here at the Washington Post. 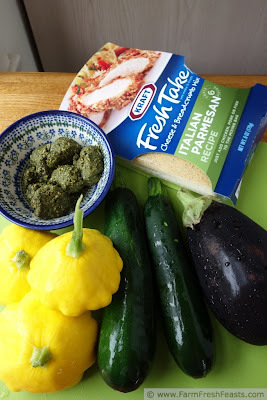 I wanted a breaded cheesy crunchy sort of eggplant chip, and I had a hunch, when I got a great coupon for Kraft Fresh Takes (not sponsored, I bought this because it was a good deal and I wanted to play), that instead of coating chicken or fish I could coat slices of summer vegetables. I tried it with zucchini, patty pan squash, and eggplant. I got a little carried away. With the leftover eggplant (because it's frequently about the leftovers around here) I decided to toss it onto a pizza. This was a good call--the breaded eggplant slices retained their crunchy cheesy eggplant goodness. Preheat oven to 375 degrees Fahrenheit. Brush a thin layer of olive oil onto a rimmed baking sheet, and set aside. 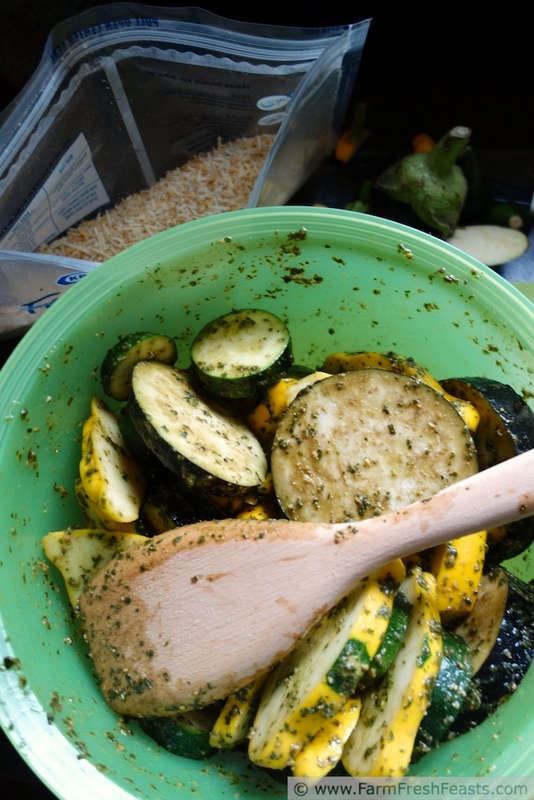 Toss sliced vegetables with pesto, then dip them in seasoned cheesy bread crumbs. Lay on prepared sheet and bake 15 to 20 minutes, then flip over and bake another 15 to 20 minutes until crumbs are browned and cheese is melted. Arrange on a pretty platter and enjoy. Save the leftovers for pizza! Please refer to my Pizza Primer post for multiple photo collages, hints, tricks, and tips for making pizza at home. Preheat oven to 450 degrees Fahrenheit. If you have a pizza stone, preheat it as well. If you've got a cookie sheet, no need to preheat it. On an oiled sheet of parchment paper stretch out the dough in the shape that pleases you. Spread pesto across near the edges. 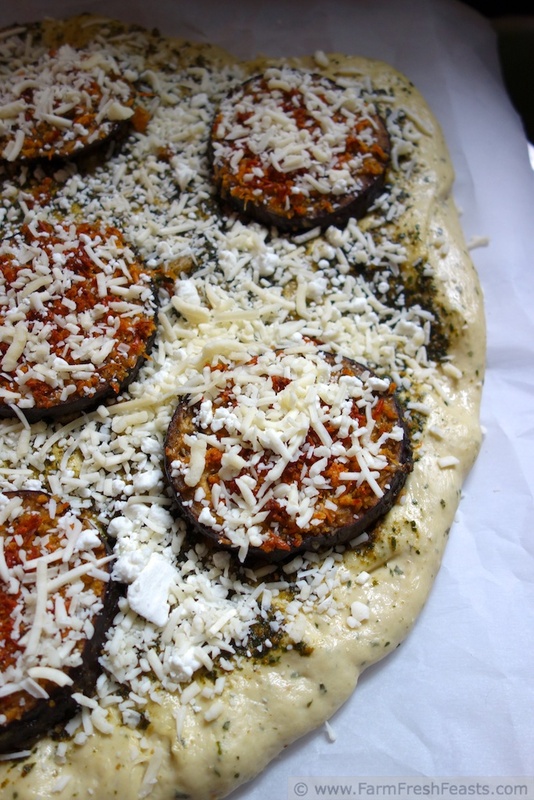 Top with eggplant slices and cheeses. Bake for 5-8 minutes, then shimmy the crust off of the parchment paper and continue to bake another 3-5 minutes until cheese is browned and bubbly. Cool on a rack a few minutes, then slice and serve. When I saw the title of this post, I thought, "eggplant chips"? I envisioned eggplant and potato chips on a pizza! So glad that's not what you've offered us! I love eggplant with cheese, too. Question: do you ever salt your eggplant and let the water out before you bake it? I have salted in the past, but I don't salt these days. No single reason, just a combination of reading here and there that 'fresh eggplant/young eggplant/modern varieties of eggplant don't need it' and the lack of bitterness when I'd forget to salt made me stop doing it regularly. These weren't soggy the first time I ate them, and definitely not the second go 'round on the pizza, so perhaps either the salt in the pesto started drawing the moisture out before they got breaded, or the baking did the trick I'm not sure. I love potato chips (have you tried potato chip crumbs thrown into egg salad and then eaten right away? Yum!) but the thought of eggplant and potato chips on a pizza doesn't inspire me at all. I love this! I usually use breaded and baked eggplant on a sandwich (or just as a snack,but now I have to try it on a pizza. Thanks, Kirsten! Now you've got me wanting an eggplant parm sandwich! I had to look up 'ulu to see that I'd've seen it as breadfruit, and I have no memory of eating it while we lived in Hawaii. If we are ever lucky to live Hawaii again, I'm on it. Kirsten, this looks just wonderful - I love pizzas topped with zippy vegetables - so good! I appreciate it! love pizza any way shape or form. On vacation it was wonderful cheese pizzas with red sauce--simple and classic. Once again, your timing is impeccable. I picked up an eggplant in our CSA share on Thursday, and I am very much like your children in that I am not a fan. I've breaded and fried it, baked it, roasted it all without real success. I can get a few bites in and then the texture freaks me out. Far be it from me to let a little thing like not liking eggplant stop me from trying to like eggplant though. I'm going to give this a whirl and report back. I'm moving on to dips, now, and will report back to you! I made the chips last night using Basil Aioli because I had it in the freezer and it sounded like a good swap. They were delicious, and now I actually like eggplant so you've made a convert out of me. I'm so glad--it's been a strange summer for me, tons of celery, not a ripe tomato (in my garden) until the second week of August. I love how a Use The Leftovers plan comes together. I'm so glad you've managed to host throughout a very busy summer. 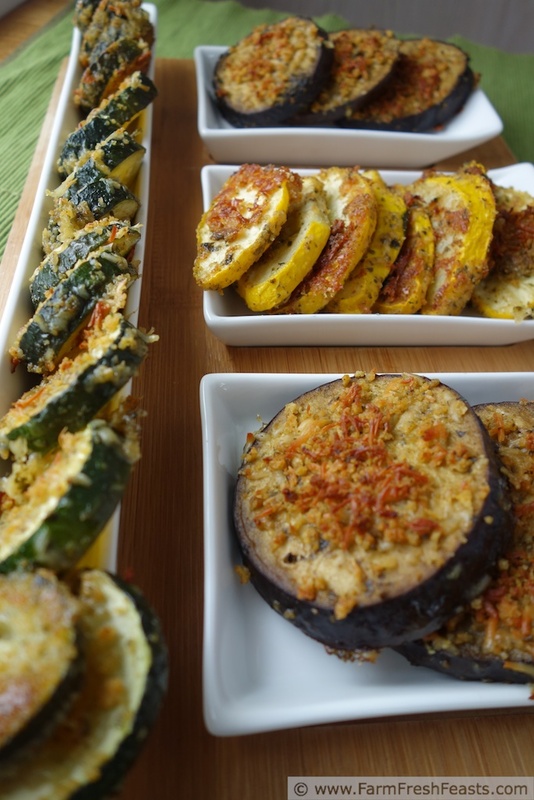 Thanks for including my recipe in your round up! I appreciate it.